Gauhati University to host All India Media Educators Conference in July. 3RD ALL INDIA MEDIA EDUCATORS CONFERENCE 2018 was held on July 06-08, 2018. 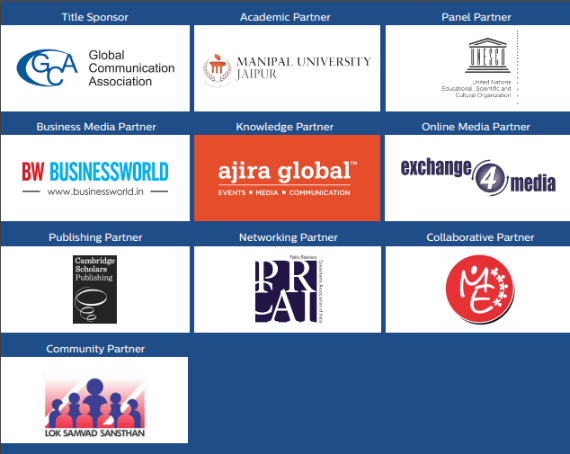 Jaipur based NGO Lok Samvad Sansthan(LSS) has joined as Community Partner and its unit All India Media Educators Conference (AIMEC)as collaborative partner during the 14th Global Communication Association (GCA) International Conference, 11-12 October 2018,at Manipal University Jaipur. The 2018 GCA India conference focusing on ‘Digital Inbound: Internet Communications and Beyond’, has aroused keen interest amongst many participants from around the globe coming from different academic and industry backgrounds. More information relating to earlier GCA conferences are available at http://www.globalcomassociation.com/conferences.html. Entry to the programme is for registered conference delegates and/ or by official guest-invitation only. Under the leadership of Prof. Dr. Kushal Kumar R, Conference Convenor, 14th GCA International Conference, Director, Department of Journalism and Mass Communication, Manipal University Jaipur, India ((https://jaipur.manipal.edu/) is the Academic Partner,hosting this conference. Kalyan Singh kothari,Secretary of Lok Samvad sansthan has been invited to be the distinguished Guest of Honour at the valedictory program of upcoming 14th Global Communication Association International Conference, 12 Oct 2018, Manipal University Jaipur. According to the United Nations Convention on the Rights of the Children, all children are born with fundamental rights. And a right to achieve these dreams. Lok Samvad Sansthan is a registered non-governmental organization (NGO) working the field of Advocacy and Research, Art & Culture, Children, Eco tourism, Education & Literacy, Environment and natural resource management, Health & Nutrition, HIV/AIDS, Human Rights, Information & Communication Technology (ICT) , Labour & Employment, Legal Awareness & Aid, Panchayati Raj, Right to Information & Advocacy, Rural Development & Poverty Alleviation, Tribal Welfare, Urban Development & Poverty Alleviation, Water and Sanitation, Womens Development & Empowerment, Youth Affairs, etc. The NGO works towards the promotion of sustainable development. The NGO was set up in 2001 and is registered under Rajasthan Societies Registration Act 1958.Its Registration number is 91/Jaipur/2000-2001. The organization is operational in Rajasthan, India. projects dealing with human development. Several media workshops were organized and media content analysis and monitoring were also undertaken from the working field of the UNICEF, NGOs and newspapers. Please click here to download the abstracts received for AIMEC 2018 till 1st July here.